Soccer fever gripped the U.S. at the same time as the smoke from Canadian wildfires gripped the skies over Vancouver, British Columbia. This was the site of the 2015 FIFA Women's World Cup Finals on July 05, 2015. The smoke that blanketed the stadium where the match was held was most likely from three wildfires in the Boulder Creek Wildfire complex that broke out in June near Pemberton, northeast of Vancouver, and exploded in growth over the last 24 hours. The Elaho Valley fire, which has been burning 67 kilometres northwest of Pemberton, was measured at 2,000 hectares in size more than 24 hours ago. It is now believed to have grown to 20,000 hectares (almost 50,000 acres or 31.25 square miles). 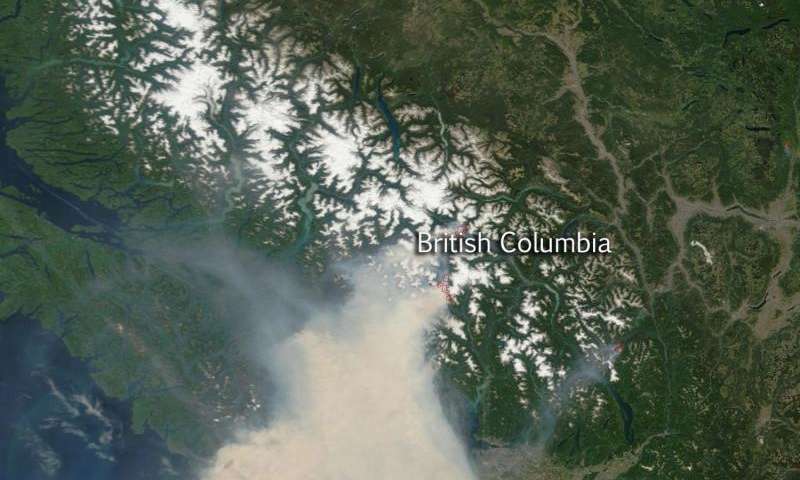 The situation is much the same for the Boulder Creek fire, approximately 23 kilometres northwest of Pemberton. It was just 500 hectares yesterday, but is now as large as 12,000 hectares (18.75 square miles). The third fire, the Nahatlatch wildfire, west of Pemberton, also continues to grow. It was estimated at 360 hectares yesterday morning, is now approximately 5,000 hectares (7.81 square miles). Officials believe all three were started by lightning strikes. This natural-color satellite image was collected by the Moderate Resolution Imaging Spectroradiometer (MODIS) aboard the Terra satellite on July 05, 2015.